I love when I am out and about in the community sharing recipes. As the creator of the Price Chopper Kids Cooking Club, I am often with kid communities & chatting about the ‘Power of a Recipe’ and how it can help us get healthy foods in our bodies. Almost always, I am adding in a surprise ingredient for my picky eater friends that totally surprises them. The Rainbow Smoothie gives me a lot of room for conversation…including how to drink up some spinach or kale. What I have discovered with my own crew is that when I use baby leaf spinach or baby leaf kale, the nutritional value is the same, but the bitterness of the larger leaf and after taste don’t exist when I add them into recipes. I love opening kids minds and helping them to discover ways to eat new foods. The last 5 years has been an incredible experience & can’t even count how many smoothies I have made, which is why I am so excited to team together with Blendtec & Fidelis Care for an exciting give-away for a BLENDTEC BLENDER! After you check out the recipe below…head over & register for this amazing give-away; its the FINAL WEEK to try for this lucky win. Here’s the link to discover more. 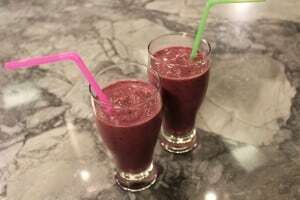 Add the strawberries, yogurt, blueberries and spinach into the blender. Make certain that there are no seeds in your lemons. If you don’t have a lemon squeezer, the juice can be squeezed out by hand, which is way more fun for kids! Simply squeeze the rind together, twisting slightly to release the juice into the blender. Repeat and squeeze the juice form the orange into the blender as well. Add in the honey, vanilla and milk. Blend & serve. 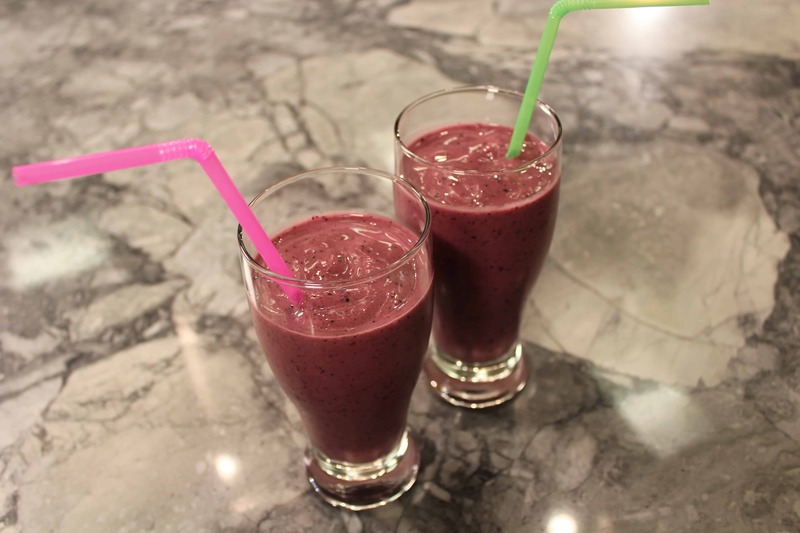 This recipe makes a delicious and thick smoothie to share. The Spinach: The kids won’t even taste the spinach in the Magical Rainbow Smoothie. If you have a picky eater, simply put the spinach into the blender with the frozen strawberries and milk already in before you invite them to the counter to help add in the other ingredients. When my kids were young & I received the ‘thumbs up’ approval on taste testing fun with hidden ingredients, I would then let them in on the hidden secret to help open their minds to finding ways to eating healthy foods. Love the creative name of your smoothie and all the healthy ingredients. Stopping by from Someday Crafts link up. I am always on the lookout for new smoothie recipes! This one looks great. Stopping by during the Fab Friday Party blog hop. Thx – they are a hit so far :)! This looks like a great Smoothie. Thanks so much for sharing your post with Full Plate Thursday. Hope you are having a great week and come back to see us real soon! I love smoothies but, I’d have to use almond milk. I think it would still work. This is perfect for when all the fresh fruits are coming back into season! thanks for sharing the recipe at the party. Pinned! Yes or rice milk. We love the almond milk, but use the rice when we don’t want the flavor to compete with some of the other ingredients. This smoothie sounds so good. Looks good, too. Thanks for sharing with us at the Funtastic Friday blog hop. Hope to see you again this week. Thanks for sharing at Share it Saturday, I will be highlighting your post this week! AWESOME! THANK YOU so much….